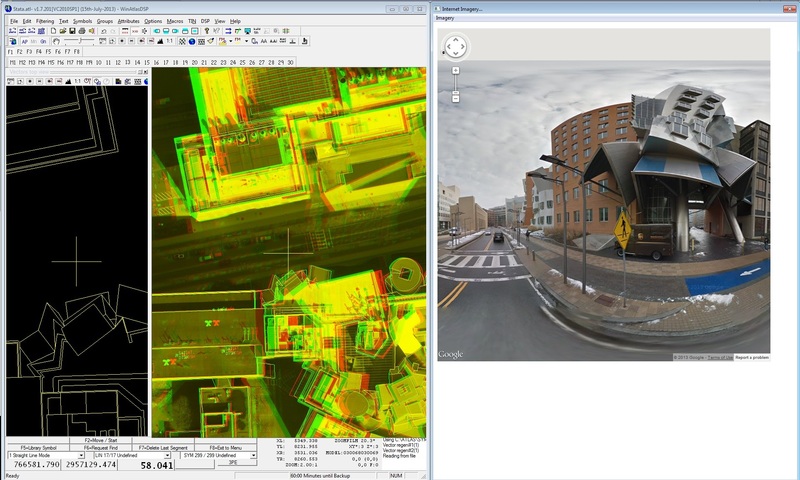 As of August 2013, our WinATLAS/DSP softcopy stereoplotter can drive Google imagery tracking alongside the stereomodel. From the "WinATLASDSP→DSP→Internet GeoImagery" drop-down menu, you can switch between Google Maps Satellite, Maps Oblique, Maps Road, Maps Terrain, Streetview and Earth 3D. You can refresh and pan to the floating mark with a hotkey or by using the "Imagery→Reload at Current XYZ" pull down menu. Or you can select "Imagery→AutoPan" and the Google imagery will follow the floating mark as you pan or roam in the stereomodel or project, e.g. driving down a road. For more samples, please see WinATLAS/DSP Google Imagery screen shots. And, yes, the building in the sample images really looks like that. It's the Stata Center at MIT in Cambridge, Massachusetts.